The Agena illuminated 1.25” 24mm reticle eyepiece is the perfect accessory for refining the alignment and pointing accuracy of your goto telescope. Reticle eyepieces are essential for long exposure astrophotography where precise polar alignment is necessary. It is also required for centering guide stars in an off-axis guider (OAG) or guide scope. The Agena illuminated 1.25” centering eyepiece is priced significantly less than competitive centering eyepieces but performs these tasks as well or better than the competition. 20mm eye relief and soft roll-down rubber eyecup make this eyepiece a pleasure to use. The 24mm focal length provides a wide 50° apparent view of the sky allowing you to find objects and alignment stars more easily than shorter focal length eyepieces. Most illuminated reticle eyepieces have a short focal length and limited eye relief, which can make for uncomfortable viewing, particularly if you wear eyeglasses. The optical features of the Agena illuminated 1.25” reticle eyepiece virtually eliminate the need to swap out a typical high-power illuminated reticle eyepiece with a lower power eyepiece to locate or center objects. The eyepiece reticle has a single etched crosshair precisely centered in eyepiece field of view for exceptional accuracy. A ring at the top of the eyepiece rotates to focus the crosshairs. The five-element optical system is fully multi-coated on all air-to-glass surfaces with high transmission anti-reflection coatings for bright, crisp views. The edges of the lenses are blackened for high contrast. The barrel is threaded for standard 1.25” astronomy filters. The metal-body cordless red LED (light emitting diode) crosshair illuminator has a rotary on/off switch that also controls the reticle brightness level. Two 1.5V batteries (included) will power the illuminator for several hours of use. These GPA76 / LR44 model batteries are readily available when replacement is needed. 4.8 (Based on 19 Reviews) 100% of reviewers recommended this product. This a very nice compliment for my Guide Scope. Good quality for the price. Once I remembered it had a focus it looks great. When out of focus the red reticle can be quite wide. I like the wide field of view in the 24mm. Very clear view. Works well, reticule focus is good, very helpful in aligning my goto. Helps with my sct polar alignment, use 9mm reticle ep on guide scope, and the Agena 24mm on main scope. It gives a wider field of view which helps during early stages of polar alignment, switching to the 9mm ep on the main scope for fine tuning. As far as reticle brightness, read where some complained of it being too bright, mine does perfect, but a simple fix would be to hole punch(big enough to cover only the reticle bulb)red taillight tape from auto store. View is sharp enough, for the little time I use it, the price and quality are good. Reticle light is heavy made, solid, if barrel not secured tight in telescope it will rotate from the weight. Used twice so far during my 03 stars alignment process. 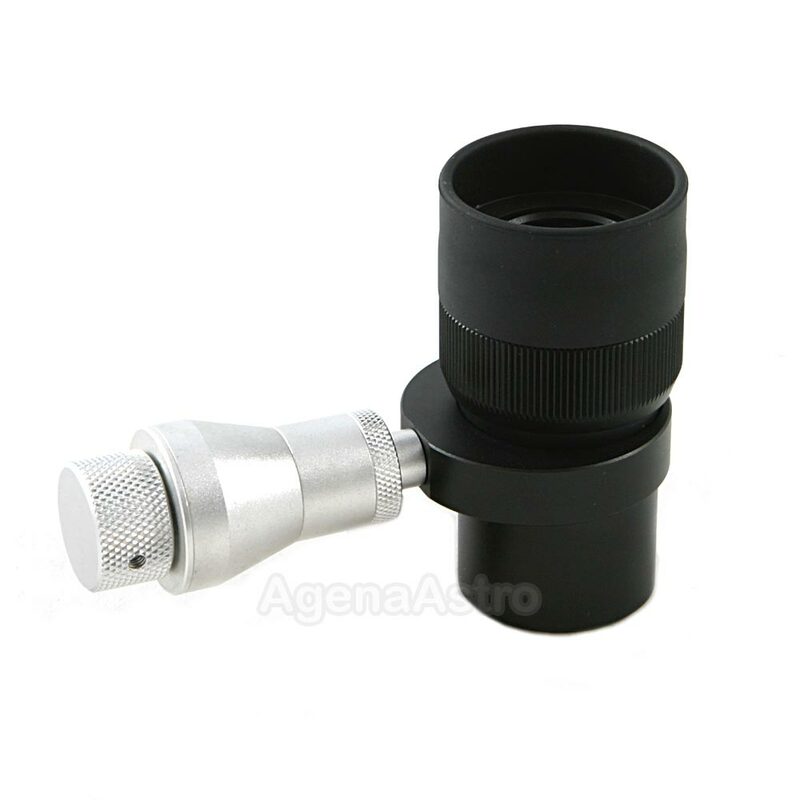 I previously tried the Agena 20mm eyepiece with dual crosshair but perfer this one. Both are well made and the illuminator is nice. It just depends on whether you prefer a single or dual crosshair. Works just fine to better star align my Nexstar Evolution mount. 4.0 Happy with my reticle eyepiece. I wanted a low power Illuminated reticle eyepiece for centering stars during goto alignment that wouldn't break the bank. For $65 I got a very nice one from Ajena. Fit, finish and quality is impressive. Crosshair has excellent construction- the illuminated reticle is sharp and brightness control makes smooth transition from dim to bright.The on/off switch has a firm click to it when turned on and off. Only reason I give it 4 stars rather than 5 is the I couldn't get the battery compartment to open (unscrew). Ajena sent me a new illuminator unit promptly with return postage to send original back to them. I definitely recommend this product. I purchased the Agena 1.25" Illuminated Reticle Eyepiece to improve the alignments with my Celestron 8se scope. Quality and field of view are very good, and the crosshairs can be illuminated with variable intensity. Very happy with it. This eyepiece makes it easy to polar align my scopes. Plenty of eye relief and field of view making it simple to find Polaris or any other alignment star. Great customer service from Agena Astro. Excellent eyepiece. I use it for a multi-star alignment and it works flawlessly. 5.0 Illuminated Reticals are a must have for alignment! This helps so very much in aligning my C8! Good eyepiece/eye relief too. Good material used. Happy with my purchase also with free shipping. While this is more complicated than a standard lens due to the additional 'piece', it does what it was designed for and quite well. I can get my scope on 'target' with greater accuracy, making a failed alignment much less likely. Review by Tom of Asheville, NC. This eyepiece is a great tool for on-point accurate telescope alignment. However, you have to be sure to turn it off when that task is done. Otherwise, you'll be buying new batteries. I know! Review by Gerry - Astrophotographer of Pittsburgh, PA. The illuminated reticle is a slender single crosshair that is easy to sight against the stellar background. The brightness is easily adjusted and work well for positioning and guiding telescope movements. Precision made and easy to use. This eyepiece is useful if you are looking for a crosshair eyepiece with a wider filed of view than most others. It performs as advertised and is less expensive than most. A good buy for me. Review by Dodge of Jackson, Tennessee. Use as alignment eyepiece for my GOTO Dob. Works great.